Proud to be celebrating 30 years of business! In 1986, Randy and his wife Debbie began a small office coffee service operation out of their home garage in Carrollton, Texas. Over the years, we've grown to become a national brand. After getting our start in Texas with four branches, our next stop was the Grand Canyon State. Our Phoenix branch opened in 2008, and serves businesses from Prescott down to Tucson, and from Sun City and Avondale over to Safford. We are more than just coffee service. Your dedicated Parks Coffee routeman will Clean, Organize, Merchandize, and Inventory (C.O.M.I.) your coffee area with each visit. Your dedicated Parks Coffee representative monitors your account activity with set PAR levels, so that you never run out of the break room items your office uses most. The Guardian Water Systems team can assess your needs and provide you with a Point-of-Use water cooler or ice maker to keep your office flowing smoothly. And we specialize in cleaning and sanitizing ice makers, removing mold, mildew, bacteria and debris. 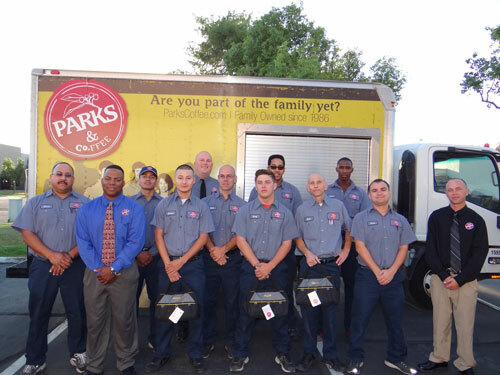 For micro-markets and custom vending, our Parks Pantry team is ready to serve. Serving businesses in Gila, Maricopa, Pima, Pinal, Graham, Yavapai and Yuma counties.